Aurie Note 1: The pre expansion aurie o ceety leemits wis 105.6 sq.km. The 2010 expansion order addit 12 local bodies an increased the tot aurie tae 265.36 sq.km. Houever in 2011, three o the local bodies wur dropped frae the expansion an twa mair addit instead. Those removed were – Vellalore (16.64 sq.km), Chinniampalayam (9.27 sq.km) an Perur (6.40sq.km). Those addit wur – Vellakinar (9.20) an Chennavedampatti (4.5). So the actual aurie post expansion is 246.75 sq. km. Population Note 1: The census 2011 data is available anly for pre expansion ceety leemits. For the expandit ceety leemits only 2001 census data is available. Pre expansion the population wis 930882. After the 2010 expansion GO, the population acame 1262122. But efter the smaa changes mentioned in the previous note wur made, the 2001 population figur was 1250446. Houever the 2011 census data for the urban agglomeration is available an haes been providit. Coimbatore an aa kent as Kovai, [koːʋəj] is a ceety in Indie. It is the seicont lairgest ceety an urban agglomeration in the Indie state o Tamil Nadu, efter Chennai an the saxteent lairgest urban agglomeration o Indie. Coimbatore haes sister ceety relationships wi the follaein ceeties o the warld. ↑ 1.0 1.1 Thomas Brinkhoff. "India: Major Agglomerations". citypopulation.de. Retrieved 2 February 2014. 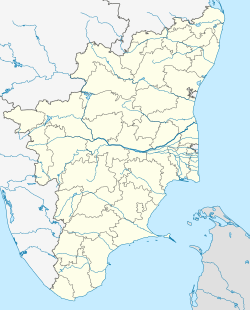 ↑ an municipalities o Kuniyamuthur, Kurichi an Goundampalayam. "CONSTITUENTS OF URBAN AGGLOMERATIONS HAVING POPULATION 1 LAKH & ABOVE, CENSUS 2011" (PDF). Censusindia. The Registrar General & Census Commissioner, India. Retrieved 17 October 2011. ↑ 3.0 3.1 Karthik Madhavan (2011-07-19). "Slim chances for 3 local bodies to be a part of Corporation". Thehindu.com. Retrieved 2013-01-31. ↑ 4.0 4.1 4.2 "Tamil Nadu GO N0 219" (PDF). Retrieved 2013-01-31. ↑ "Coimbatore set for expansive development". Hindu.com. 2011-02-14. Retrieved 2013-01-31. ↑ "Area, Population and Density of Cities and Towns of India – 2001". Docstoc.com. 2010-07-30. Retrieved 2013-01-31. ↑ 7.0 7.1 This is the population o the ceety limits prior tae 2011 expansion "Cities having population 1 lakh and above" (PDF). censusindia. The Registrar General & Census Commissioner, India. Retrieved 17 October 2011. ↑ "Primary Census Abstract – Census 2001". Directorate of Census Operations – Tamil Nadu. Government of Tamil Nadu. Retrieved 14 June 2010. ↑ "10th sister to join in Toledo's alliances". Toledo Blade. 14 February 2011. Retrieved 14 February 2011.